Headaches induced by the flu can be quite painful and incapacitating, especially if they occur alongside other symptoms such as fever or fatigue. 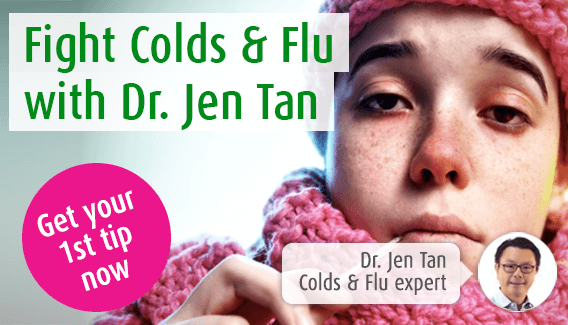 In this page, our immune system expert Dr. Jen Tan explores how the flu can cause headaches and what home and herbal remedies are available to alleviate any pain or discomfort. A headache caused by the flu will usually occur alongside other symptoms. Suffering from a headache can make it difficult to think and concentrate, but this alongside other flu symptoms is often what makes having the flu such an unpleasant experience. This type of headache should not last for more than a few days. Why am I experiencing headaches with the flu? Headaches caused by the flu often occur alongside a fever. Flu viruses cannot multiply in high temperatures, so your body raises your temperature, resulting in a fever. This causes your blood vessels to dilate, increasing the pressure inside your head, causing feelings of heaviness or pounding as well as pain. In addition, headaches can be worsened by sinus pain. When you have the flu, the mucous membranes lining your sinuses and nasal cavities can become inflamed. This also leads to increased pressure around your face and eyes, worsening your headache. Home remedies are often designed to make you feel more comfortable rather than to treat your condition. For a headache, reducing the pressure inside your head and clearing any nasal congestion helps to reduce pain. Some people find that a warm cloth on their face by their sinuses helps to loosen the mucus, thus reducing inflammation and congestion, relieving a little pressure around the face and eyes. Additionally, congestion can be cleared by inhaling steam with peppermint, or another menthol-based inhalation. However, be careful not to scald yourself. Others, on the other hand, find that a cool cloth on the forehead or temples helps to reduce dilation of blood vessels in the head easing the pressure and pain. Lying down in a quiet room in which you can dim or turn off the lights often helps you to feel better. However, lying flat can cause nasal congestion to worsen, and so it is worth lying slightly propped up. The most effective way to use herbal remedies in this situation is to address the underlying problem by supporting the immune system, rather than those which are directed towards individual symptoms. For this reason, licensed herbal remedies such as Echinaforce® Echinacea tincture or tablets should help you to fight off the infection more quickly. This contains fresh extracts of the Echinacea plant, which has been used for many years as a support for the immune system. Are there conventional medicines to help with headaches? Generally speaking, persistent headaches, headaches with unknown cause, or which are accompanied by dizziness, vomiting or confusion should always be checked by a doctor. In addition, medical attention should be sought if a headache occurs after a knock to the head. After ruling out any underlying causes of headache, a doctor may prescribe anti-viral drugs, Oseltamivir or Zanamivir, in severe cases of the flu, or in vulnerable patients, such as the elderly. More commonly, there are several flu remedies available over-the-counter, often containing paracetemol or aspirin, designed to reduce fever. If this is achieved, then your headache is likely to ease.